GlobalTempViewManager is the interface to manage global temporary views (that SessionCatalog uses when requested to create, alter or drop global temporary views). 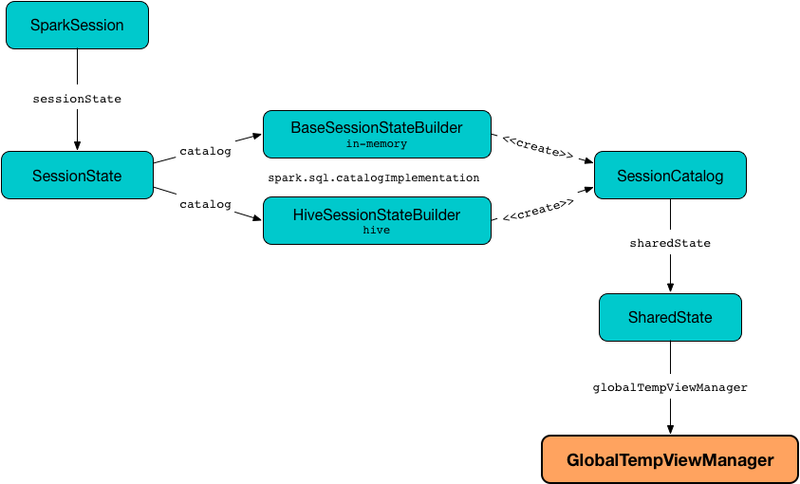 Strictly speaking, GlobalTempViewManager simply manages the names of the global temporary views registered (and the corresponding logical plans) and has no interaction with other services in Spark SQL. GlobalTempViewManager is available as globalTempViewManager property of a SharedState. GlobalTempViewManager is created exclusively when SharedState is requested for one (for the very first time only as it is cached). GlobalTempViewManager takes the name of the database when created. Registry of global temporary view definitions as logical plans per view name. clear simply removes all the entries in the viewDefinitions internal registry. clear is used when SessionCatalog is requested to reset (that happens to be exclusively in the Spark SQL internal tests). create simply registers (adds) the input LogicalPlan under the input name. create throws an AnalysisException when the input overrideIfExists flag is off and the viewDefinitions internal registry contains the input name. create is used when SessionCatalog is requested to createGlobalTempView (when CreateViewCommand and CreateTempViewUsing logical commands are executed). get simply returns the LogicalPlan that was registered under the name if it defined. get is used when SessionCatalog is requested to getGlobalTempView, getTempViewOrPermanentTableMetadata, lookupRelation, isTemporaryTable or refreshTable. listViewNames simply gives a list of the global temporary views with names matching the input pattern. remove simply tries to remove the name from the viewDefinitions internal registry and returns true when removed or false otherwise. remove is used when SessionCatalog is requested to drop a global temporary view or table. update is used exclusively when SessionCatalog is requested to alter a global temporary view.